Are you a business owner, or responsible for holding meetings at the office? It’s estimated that around 60% of those with hearing loss are in the workforce or an educational institution, so making your workplace accessible for everyone is extremely important. 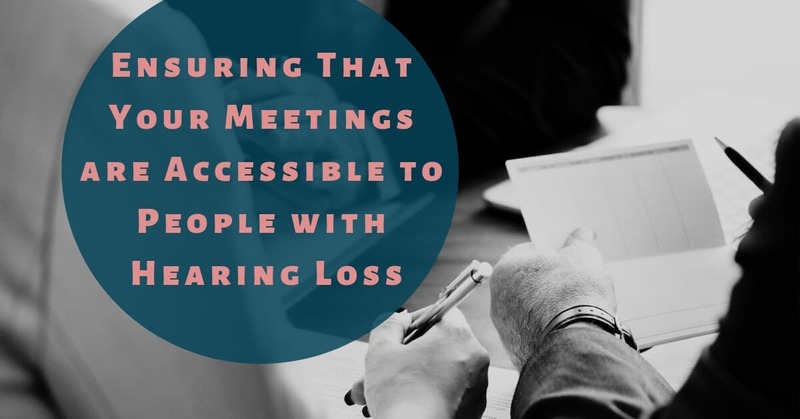 If you often find yourself in the board room, or delivering lectures to students, you need to take some time to make sure your meetings are accessible to people with hearing loss. Take a moment to learn accessibility strategies, and be sure you’re using the technology that will make it easier for everyone to hear. Hearing loss is often called an invisible disability because you can’t see what another person is hearing or not hearing. You need to realize that even if a person looks like they’re hearing you, they might be straining to make out the words, and aren’t actually understanding the meaning of what you’re saying. Have you had successful one-on-one conversations with people in your office who are hard of hearing? Maybe you had a private meeting and they were able to hear your perfectly. It’s important to realize that in a quiet setting it’s easier for them to understand you, and they’re far more likely to hear, understand, and reply appropriately. In a crowded meeting room, with a lot more space and distance, and full of competing background noises or multiple speakers, they may struggle to understand what’s been said, or completely mishear you. To break down communication barriers, presentation skills training is important to ensure that everyone in your office is a competent speaker, and can present information clearly so that everyone will understand. Raise awareness about hearing loss in the office, and make sure that everyone is practicing inclusion. If someone in your office has hearing loss, be sure to put them close to you in a meeting. They’ll have an easier time focusing on what you’re saying if they’re not distracted by other sounds in the room. Watch for non-verbal cues such as nodding that they’ve understood, or rustling around in the chair if they’re unsure of what’s been said, and repeat things as necessary. There’s a wealth of exciting new technology at your disposal, and if someone in your office has hearing loss, you could be benefiting by learning more about the accommodations available. One of our favorites is closed captioning for accessibility in meetings, teleconferences and other larger events, whether in person or online. You can easily provide communication access via real time captioning. This doesn’t have to be complicated or expensive, but real time captioning can be made available on personal cellphones or laptops. Those with hearing loss can understand everything that’s been said, and participate in conversations, meetings, and conferences with ease, adding their expertise and value to your meeting. These inclusion strategies aren’t just to comply with equal access policies, but will help you get the best outcome from your team, and see your business improve and grow. Are you in struggling to hear in the workplace? Do you strain to hear in meetings, and worry that you’ve missed some important information? If you’ve been denying your hearing loss, or think that admitting you’re struggling to hear will make you seem old, think about how much easier your life would be if you could hear clearly at the office, whether at your desk, in a private meeting, or during a conference call. With a quality pair of hearing devices, you can do just that! Today’s hearing technology are small, sophisticated devices that are tiny and easily go unnoticed. Some hearing aids actually sit within the ear canal, are controlled using a smartphone app, and are invisible. No one will think you seem old because of your hearing devices, and the only comments you’ll get are on how well you’re hearing. Your job performance will improve, you’ll be able to participate in office banter, you may get that promotion you have your eye on, and you’ll continue to be a valued member of your team at work. Call us today at My Hearing Centers to find out what hearing aids can do for you, and start your journey to clear hearing.